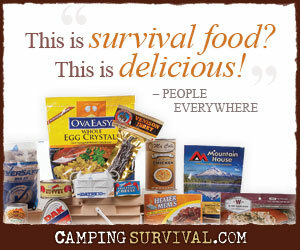 The following article has been contributed by a fellow prepper named Jeff. It has been published with permission of the author. Cheap Cheap (Not just for baby chickens) Ranging in price from 9.99 – 39.99 a basic slingshot (or its brother the wrist rocket) will not stretch the budget of even the most frugal prepper, in fact if you are as cheap as I am you can even make one from scratch using a tree branch and an old bicycle tire inner tube. No Box of Rocks here! Do you have boxes and boxes of various kinds and types of ammo? No need to fear, as long as there a rocks on this earth you have ammo for your lowly slingshot! This is a great benefit in a long term TEOTWAWKI situation as you can hunt small game, squirrels, rabbits, and birds of all kinds without using up your LIMITED resource of ammunition for your small caliber rifle or shotgun. Hush little baby! The slingshot is quiet, and this has several very useful benefits. When you sling your shot you will be making little to no noise to frighten off other food. Sure you can take a squirrel at 100 yards with your .22 Marlin rifle, but if you miss, all of his yummy buddies have been scared off! More importantly to me, living in a semi urban area at the moment, I will not be announcing my presence to everyone in a ½ mile radius, and we all know all of those ears will not be friendly ones. Troop optimization! Last but not least, my 5 year old can use one, with very limited potential for self inflicted wounds. Not only that but as he gets older he becomes a hunter as we are hiking, and going about daily business doubling our potential food gathering. So there you have it. My thoughts on our friend the slingshot. What’s The Difference In A Carbine And Rifle? I love it, Jeff! Thanks for the contribution! i have had one to and some of my friends still use slingshots on occasions to hunt.